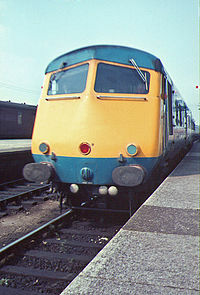 The Blue Pullmans were luxury trains used from 1960 to 1973 by British Railways, the first Pullman diesel-electric multiple units, incorporating several novel features. Named after their Nanking blue livery, the trains were conceived under the 1955 Modernisation Plan to create luxury diesel express trains aimed at competing with the motor car and the emerging domestic air travel market. Although not entirely successful – they were seen as underpowered, unreliable, and ultimately not economically viable – they demonstrated the possibility of fixed-formation multiple-unit inter-city train services, and inspired the development of the Inter City 125, which resembles them in having an integral power car at each end of the train.